It was fine. Until it wasn’t. Every accomplishment starts with the decision to begin. The argument was the same week after week. I’d stare back blankly, which would elicit a “Do you hear me?” from him. … and the cycle would continue. Our family of four was living from paycheck to paycheck. Code Red was my husband’s creative term for don’t buy ANYTHING; the checking account is dry. Using the credit card for groceries and gas “to get by” was, well, it was fine, until it wasn’t. One day, out of nowhere, we found ourselves drowning in minimum payments. That’s the thing about credit cards; it’s easy to swipe and forget. Couple that with a series of unfortunate events, you find yourself suddenly jump from feeling financially secure to utterly in debt. How does your debt compare with other families? Debt balances are current as of Q3 2016; chart from Nerd Wallet and figures by the Federal Reserve. When we tallied our debt (credit cards, auto loans, student loans, home equity loan), we realized we had accrued over $82,000 in debt. Sadly, over a third of our debt was owed to credit card companies. When we did the math, most of my salary (working 32 hours a week) was going toward our minimum payments. Every week, I was spending thirty-two hours away from my kids and working only to stay afloat. And we all know how far paying minimums goes toward actually paying down a credit card. It all felt hopeless. How could we pay down over $80,000 in debt when we couldn’t afford to buy diapers without using a credit card? I remember listening to the lyrics of a Blind Melon song and thinking we’ll never see the sun from here; we’ll never be able to get out of debt. If you have a moment, listen to the song. Honestly, the biggest challenge to getting out of debt is believing it is possible. If our family can do it, yours can too. It is not easy, but it is possible. YOU are taking the first step toward debt-freedom simply by being here and reading this post. I have today. Yesterday is gone. All the mistakes, failures, poor choices, all the things I wish I could do over, they are gone. Today stands before me with arms wide open. It is never too late to begin again. This hopeful truth is yours too. So, let’s chat a bit. Where are you feeling stuck most when it comes to your finances? Also, do you feel like your spouse is on board with your quest to be debt-free? I am happy to be completely transparent about our financial story (how we go there, what we did to get out, where we are now, etc). What part of our journey to being debt free and becoming unbusy should we share next? Leave me a comment below or leave a private message on in our Facebook group. It is challenging to truly become UnBusy and enjoy the small moments in life if you’re always worried about money. Financial hardship is an enormous strain on families and marriages. You’re not alone. 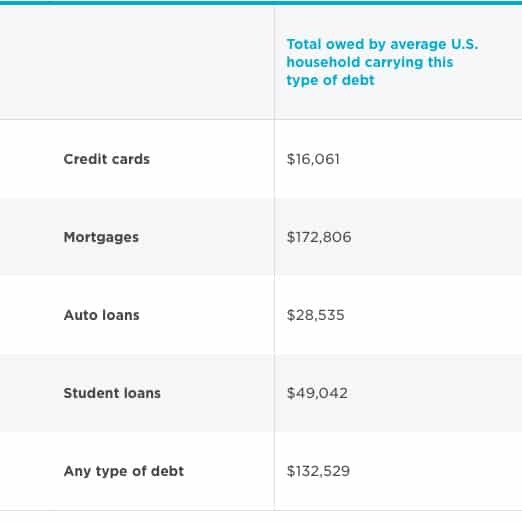 The average American family owes over $16,000 in credit card debt. Moving toward debt freedom is a huge step in Becoming UnBusy. The first step to being debt free is believing it is possible. You *can* do this.